The Greek far-right party Golden Dawn has been flirting with an “outlaw” rhetoric lately. Appealing to a disgruntled electorate, its MPs constantly try to point out that the Golden Dawn is unlike any other political party in Greece. They are right in this respect. In fact, they are not a party at all: they are acting like a gang of criminal thugs, and it should not be beyond the pale to declare their organisation as such. “We feel disgusted in the parliament,” said their leader, Nikos Mihaloliakos, in a speech to his followers on 25 August. “If they want us to, we can abandon it at any given moment and take to the streets. There, they shall see what the Golden Dawn is really about, they will see what battle means, they will see what struggle means, they will see what bayonets sharpened every night mean”. Holding torches, they shouted “blood, honour, Golden Dawn” – a direct translation from the German “Blut und Ehre”, the motto once carried by the Nazi SA. “It’s you who are our Storm Detachments (Sturmabteilung). Let them come after you!” he continued, in his usual Nazi-inspired terms. Singing their official hymn “Raise the flags high” – again, a direct translation of the Nazi stormtroopers hymn “Die fachne hoch” – young men and women call for open, violent conflict both with the state and with any opponents on the ground. It’s not unusual for far-right parties to use populist rhetoric to persuade their followers, and for very specific reasons: despite their claims to abhor the parliamentary system, they seem comfortable enough taking advantage of the privileges Greek MPs enjoy, including immunity from prosecution. Several Golden Dawn MPs are awaiting trial for crimes, ranging from armed robbery to severe bodily harm. The now infamous Golden Dawn MP and spokesman Illias Kasidiaris is wanted not just for attacking two leftwing MPs on live television – images of which were seen around the world – but also for accessory to robbery, bodily harm and illegal gun possession. His trial for the later offences was to take place on 3 September, but he used his parliamentary privilege to have it postponed. Kasidiaris is by no means an isolated case of thuggery. Only a few hours before the severe beating of four Egyptian fishermen in Crete’s Perama, Ioannis Lagos, another Golden Dawn MP, proclaimed “Egyptian fishermen will be held accountable by the Golden Dawn, and by the Greek people for their activity” in a speech he gave there. Inciting racial violence would be, of course, illegal in Greece, but he wasn’t prosecuted. A few days ago, inside the parliament this time, Golden Dawn MP Dimitris Koukoutsis allegedly violently attacked two leftwing MPs and the president of the Pakistani community in Greece, Javet Aslam. The case is still open. 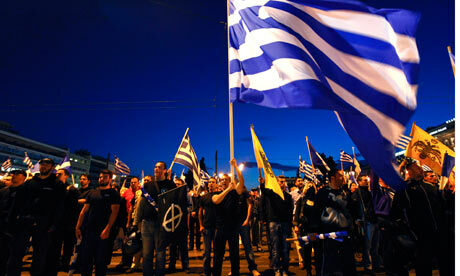 The Golden Dawn makes a mockery of the Greek history it claims to venerate. It does this by disrespecting every democratic principle we Greeks, as a nation, should be proud to uphold. But its MPs never go so far as to quit their parliament seats. Mihaloliakos and his followers seem to be quite comfortable in taking advantage of the exposure their party is currently enjoying, as well as the extra funding for their well-oiled PR machine. They thrive inside the very system they claim to despise. By swearing on using violence against anyone they deem unworthy, the Golden Dawn is not unlike a criminal syndicate. It should no longer be treated as a legitimate political party. Even if it means they are temporarily shot up to “hero” status, they have to be banned from the political process. The fact that it was provided with this platform was wrong in the first place. Now we must have the courage to ban it from parliament. Allowing messages of hate to be broadcast day and night while we look from afar, heads nodding as our society implodes, is inexcusable. We simply can’t allow immigrants to be brutally beaten and stabbed in our streets every day. Mihaloliakos says he feels disgusted and uncomfortable being inside the Greek parliament. Well Mr Mihaloliakos, the feeling is mutual. Posted on September 5, 2012, in Europe and tagged Golden Dawn, Greece, Neo-Fascism. Bookmark the permalink. Leave a comment.